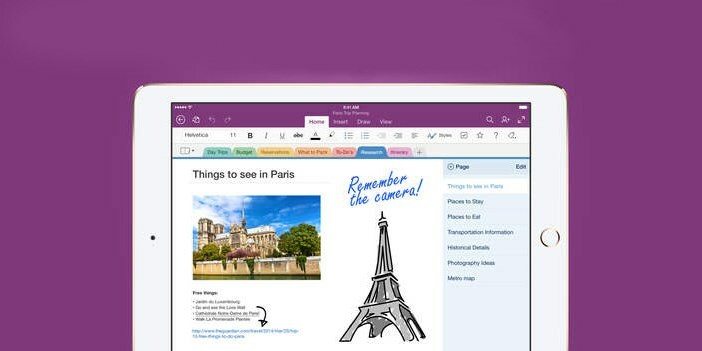 Microsoft has merged its OneNote note-taking apps on iOS and added a few new features for the iPad and Android devices. When iPad users get the latest version of OneNote, they’ll be able to create notes and lists from a new Today widget in the Notification Center. There’s also a Recent Notes view to help you quickly find the notes you created last, across all your notebooks. In addition, turning your iPad into landscape mode, you’ll be able to see page previews, which should give you an idea of how much of your content fits on a page. Microsoft says it’s also fixed a bug affecting the document/whiteboard camera feature, so you can now snap a photo of any paper documents to add to your notes. On Android, OneNote now lets you move and copy pages between notebooks and sections. Locate your desired page, tap and hold to reveal options and then select a destination for it. You can also add shortcuts to pages to your home screen. Microsoft notes that it also has a major update for Android Wear coming soon. You can sign up to try it in beta when it launches.